I have been horse mad all my life. As a very young girl I thought that, if I hung upside down from a branch of a tree for long enough, a horse would appear for me. One day, the most amazing thing happened, 2 girls were riding by and one of them fell off and was in a bad way. The other girl rushed to our house, and my mother got the girl to lie down in the lounge, and I was told to hold the horse. I wasn't even 5 at that time, and I remember standing there, holding the reins of this little fuzzy pony, wondering if this was the pony for me. Of course, once the girls parents arrived and took her home my bubble burst, they took the pony away! I don't think I hung upside down so much after that! We moved to another town and my parents bought a large piece of land, and all I wanted to know, was "Can I have a pony?" I got Suzie, and Sugar, then I got a jack, called Lucky, and as a result of that, I got sweet little Frosty. I'm the one on the right of the picture. They were great little creatures, so clever, so cunning! Not stupid at all as some people think. 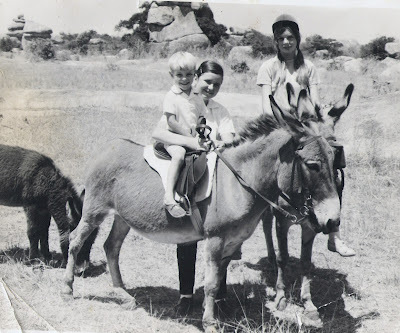 They were masters of escape, I spent a lot of my time riding around our neighbourhood, with a bucket of horse food, crying, looking for my donkeys, who loved going to a local farm and ganging up with the herd of cattle. I got bucked off, and dragged through trees and bushes.I know every bad habit in the book. And as I learnt to ride myself, I got a lot of bad habits too! Fast forward 30 years, and here I was in New Zealand, in a rural area. I got myself a little miniature horse, called Smudge. He was very cute, but absolutely useless for anything! The miniature horse has the same appetite as a normal horse, and can get very fat, and then they go lame. He was getting fat. I got sensible, and found him a home where they could care for him the right way, and they trained him and children rode him. My neighbours have horses. Lots of them. They have kindly let me 'borrow' one of theirs. I just love her. She is called Chocolate Box, because her face is so pretty her picture could be put on a Chocolate Box. She was a racehorse about 8 years ago. I put shoes on her every 6 weeks, and at $140 every 6 weeks they cost more than any of my shoes! I bought a saddle, and a bridle. So I own all the outer things, just the horse in the middle isn't mine. 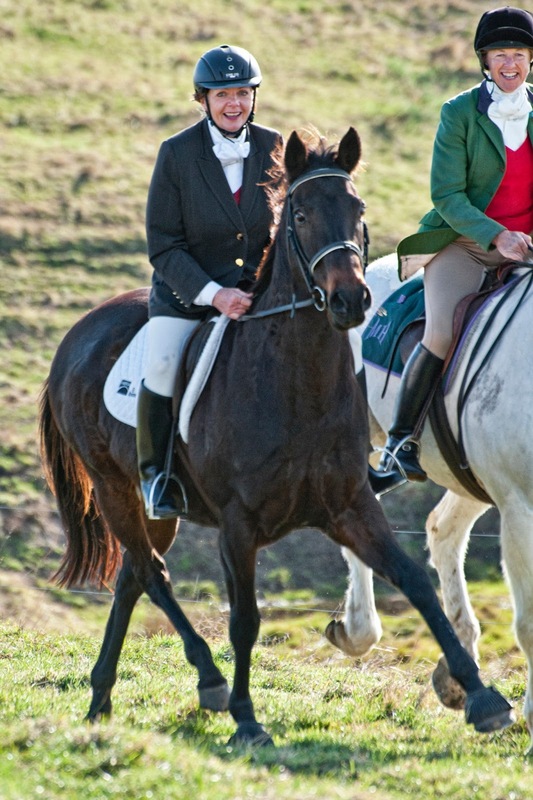 I have a strange vision in my head of me in the saddle in mid air, with 4 shoes beneath me, holding the reins! This is me and Chocolate all dolled up ! We are excited as each other! Today is a gloomy wet kind of day, and I had a plan... I thought Chocolate was looking a bit down in the dumps the other day. and so I wondered if she would like a bit of a pick me up.....I popped into our local 2 Dollar shop and went and bought some cheap hair dye.... 3 for $6! I said to my husband, "I'm just going over to play with Chocolate a bit" I didn't want to tell him what I was up to! I got my hair conditioner, my old hairbrush and some scissors. Sneaked out the other way so he couldn't see what I had. When I got to the stables, I opened up the box and put the gloves on. The chap who lives in the house near the stables came over to watch me and have a chat. Now, I made one fatal mistake... the gloves in a hair dye kit are fine if you are doing your own hair, but not very good if you are rubbing your hands up and down a horses mane and tail! Also, it is a good idea to really concentrate while you are handling so much hair dye! I'd love to take a photo of how lovely her mane and tail look, but its a rainy day and all you will see is a rather wet and bedraggled horse in a muddy horse rug. I quickly painted her feet too, so she had a nice pedicure, and will look so pretty when all the rain stops and she's not so muddy. Then , as I walked home, I thought, there's a bit of that dye left, maybe I should just touch up the silvery bits in my hair. And before I knew it, I had gone from a mousy brown to a brunette! Back to the gloves...Next time I do this I will have to get some decent ones! I think I'll need to wear lacy fingerless gloves for the week! I CANNOT get it off! Any suggestions?